Marie-Laure lives with her father in Paris near the Museum of Natural History, where he works as the master of its thousands of locks. When she is six-Marie-Laure goes blind and her father builds a perfect miniature of their neighborhood so she can memorize it by touch and navigate her way home. 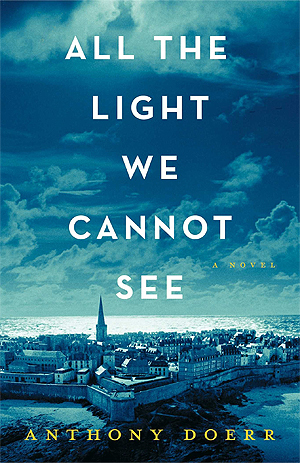 When she is twelve, the Nazis occupy Paris and father and daughter flee to the walled citadel of Saint-Malo, where Marie-Laure's reclusive great-uncle lives in a tall house by the sea. With them they carry what might be the museum's most valuable and dangerous jewel. In a mining town in Germany, the orphan Werner grows up with his younger sister enchanted by a crude radio they find. Werner becomes an expert at building and fixing these crucial new instruments, a talent that wins him a place at a brutal academy for Hitler Youth, then a special assignment to track the resistance. More and more aware of the human cost of his intelligence, Werner travels through the heart of the war and finally, into Saint-Malo, where his story and Marie-Laure's converge. This has been sitting on my to-read list for quite awhile. And then the Director of my library decides to go off on an adventure out west, leaving me the fun job of (and I'm not saying that sarcastically) hosting her book club for the month...and moving this here book up to the top of my reading list. Thing was, I wasn't really paying attention to the date, finding myself a weekend away from said book club without having cracked open the cover. So to say it was a power-reading would be an understatement. But luck was on my side, and Overdrive sweetly delivered the audiobook into my bookshelf just in the nick of time. And the book was beautiful. I mean, the world kind of already knew that, you know, with the whole Pulitzer Prize for fiction award going for it. As much as it's a story about WWII, it's more a story about people, courage, and the resilience of the human spirit. Marie-Laure wasn't born blind. Her blindness came quickly as a child, and instead of falling prey to self-pity, she is taught to be strong and independent by a father who believed her to be capable courageous. When the war arrives in Paris, Marie-Laure's father becomes the safeguard of one of the Museum of Natural History's most valuable treasures...a diamond thought to be plagued by a curse. On the other side of the war is a young orphan boy raised in a mining town without a hope. His life is destined for the mines until he find a small radio and discovers a talent that will offer him a way out. The German army finds a way to use his talent with radios to triangulate signals and hunt down the enemy, but this young orphan boy realizes he has traded one life of misery for another. At times I almost forgot this was a book about war. I became so invested in the lives of these two young people that the bombs and the soldiers disappeared. There were, of course, those moments when they were very much surrounded by the horrors of oppression and torture, but while those moments provided a context for the story they did not overwhelm it. Doerr's writing style is both complicated and accessible. He skips freely between characters and time periods in short chapters but never loses focus on the story. There were many times his writing style reminded me of the narration in the movie Amelie, skipping around to different events in short snippets. As an audiobook, this isn't the easiest set up, but I quickly adapted and had no trouble determining where i was in the story. I liked this story. I really did, but I didn't form an emotional attachment to the characters like I did in the stories by Elizabeth Wein and Ruta Sepetys. I worried about Marie-Laure and Uncle Etienne. And I was devastated with the conclusion of Werner's story, but the book and its characters didn't stay with me, didn't leave me wondering or concerned when I was finished. This was good, but I'm not sure I understand the Pulitzer Prize. But that doesn't really mean much since I read almost solely teen fiction during 2014 :) I did, however, get to enjoy a wonderful discussion with some extremely interesting ladies, and that kind of makes it a great book.